Pan, tilt and zoom cameras are capable of providing full 360° vision of the grounds surrounding your property, allowing you to track movements and survey a wider field of view than conventional fixed cameras. With CCTV systems being the first point of detection within many properties, PTZ cameras utilise the latest technology to provide pinpoint accuracy. The main benefit of these cameras comes from their ability to patrol large areas efficiently with capability to zoom up to 1,000 feet. Solution: PTZ CCTV Cameras with full 360° vision for a wider field of view. 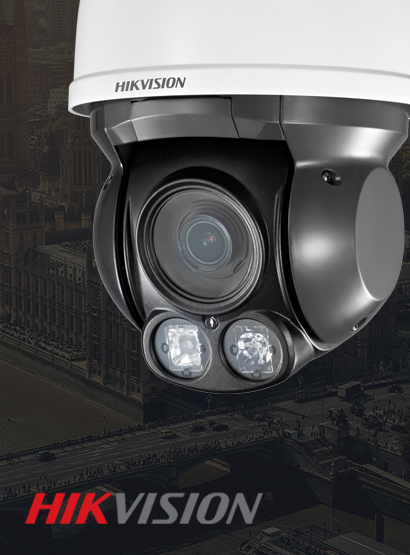 Double the strength of your CCTV surveillance whilst decreasing the amount of cameras needed. Perfect for large open spaces, PTZ cameras are capable of full 360° vision. One PTZ can provide the same coverage as multiple fixed cameras. Some of our PTZ cameras come with motion tracking, allowing you detect intruders and track their movements within your perimeter. PTZ cameras can detect movement and zoom-in with pinpoint accuracy, providing crisp facial and number plate recognition. With full integration, your surveillance systems can even provide a second visual verification of triggers from alarm PIR detectors.